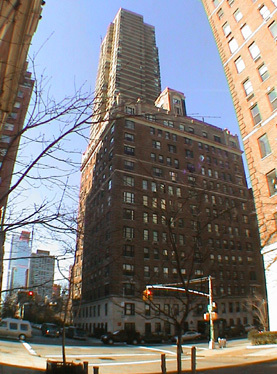 This very handsome, 14-story, pre-war apartment building is a cooperative and has 49 units. A red-brick building, it is diagonally across from the townhouses that share a communal garden on the east side of Sutton Place between 57th and 58th Streets and therefore it has many superb, protected views. The elegant building has a two-story limestone base, a canopied entrance with doorman, fireplaces and some balconies. It permits protruding air-conditioners and has no garage and no health club. It is not close to a subway, but is very close to a nice park overlooking the East River.